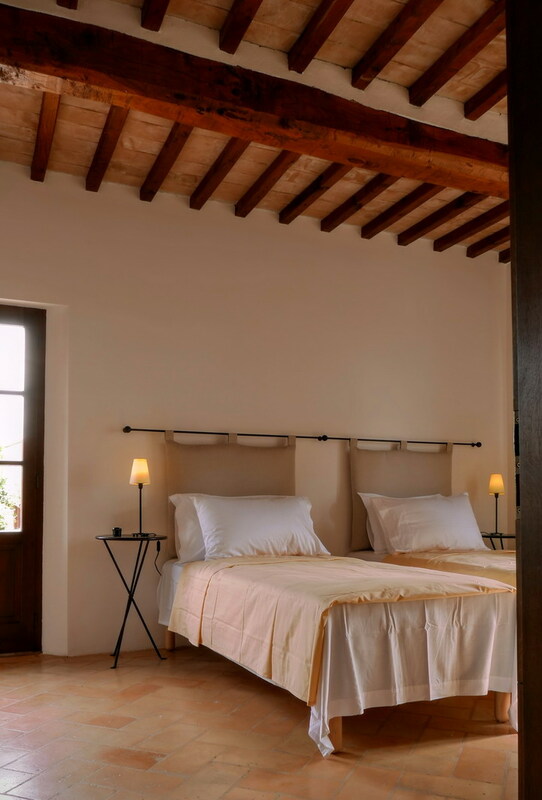 Podere Il Vigneto is located all along the renowned Strada del Vino Nobile, between the two lively cities of Montepulciano and Cortona. The cypress-lined path gently leads to the Podere, tucked on the top of a hill and surrounded by fine vineyards, where the well-known Cantine Avignonesi and Antinori stand out. 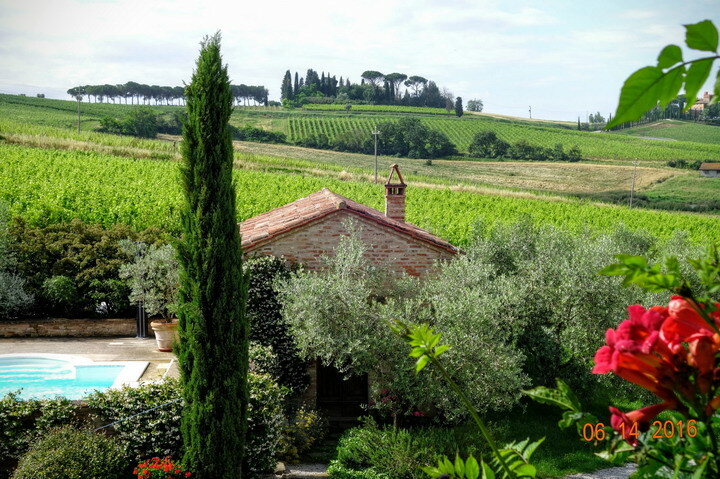 Here, in this marvellous panoramic context stands Podere Il Vigneto, perfect for a party of 8. 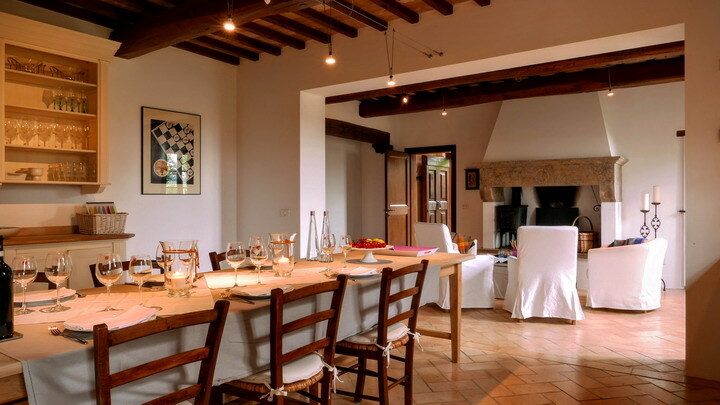 The main house, suitable for 6 people, develops its 200 square metres in two floors: the ground floor hosts the spacious living room, the fascinating kitchen, dining room and intimate sitting room opening on the antique and the original fireplace. From the dining room, guests can easily access the fully equipped veranda ideal for al fresco meals under the pergola shadow. The ground floor hosts a spacious twin bedroom (which can be arranged as a double upon requests) and a full bathroom with shower. On the upper floor there are two double bedrooms, each with private bathroom, and a tiny living room with sofa and armchairs. 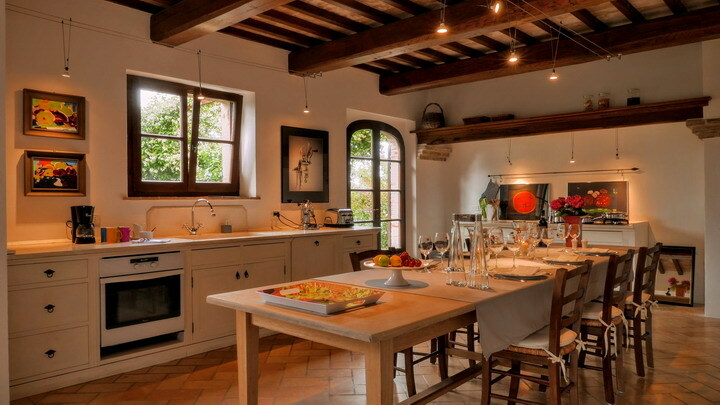 The close 55 square metres Annex is composed of a dining room, a double bedroom, a bathroom and a living with kitchenette where the original and still functioning wood-burning oven is, ideal to bake great authentic pizzas. At guests disposal, two private and equipped terraces, ideal to spend relaxing moments and a marvellous private pool. The main terrace is provided with tables and chairs and it is perfect to enjoy a great meal while sipping an excellent glass of wine. Shaded corners offer intimate spaces ideal to chill out reading an interesting book while having a front row seat on postcard landscapes! 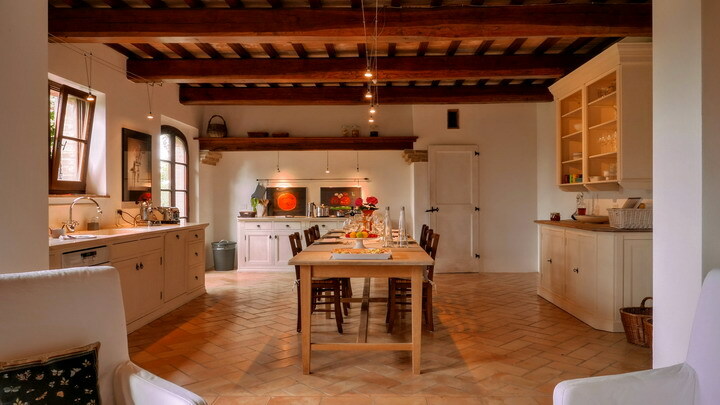 The owners, a very discreet Danish couple, live in a portion of the main Villa with private and independent entrance. 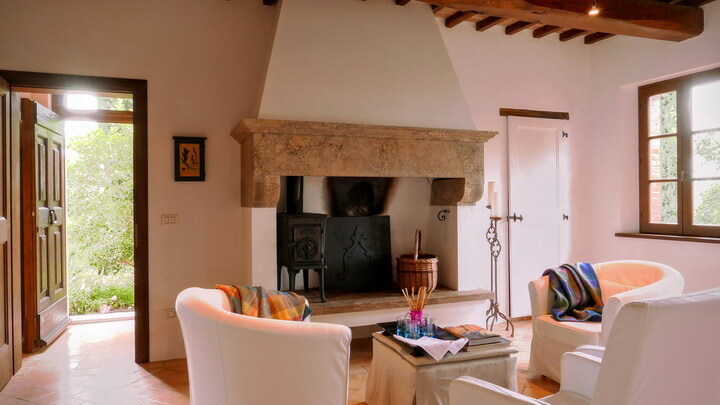 They are at your complete disposal for any kind of assistance or just to provide some suggestions on your Tuscan holidays. The Villa, the pool and the private garden are at guests exclusive use only and they are not used by owners. The area is particularly renowned among sportsmen and cyclists, that can test themselves on pleasant walks, rides among vineyards or splendid bike routes. 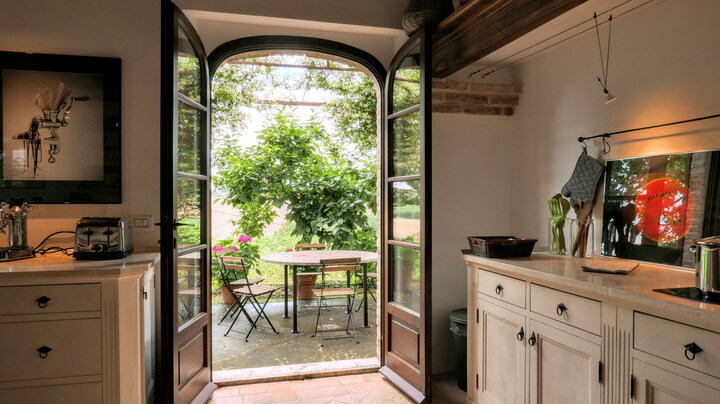 Guests will take the chance to taste the best local food and wine thanks to the proximity to peculiar Etruscan towns, Medieval and Reinassance, among these Cortona, Montepulciano, Arezzo, Siena, Perugia, Pienza, Montalcino, Castiglion del Lago and much more. 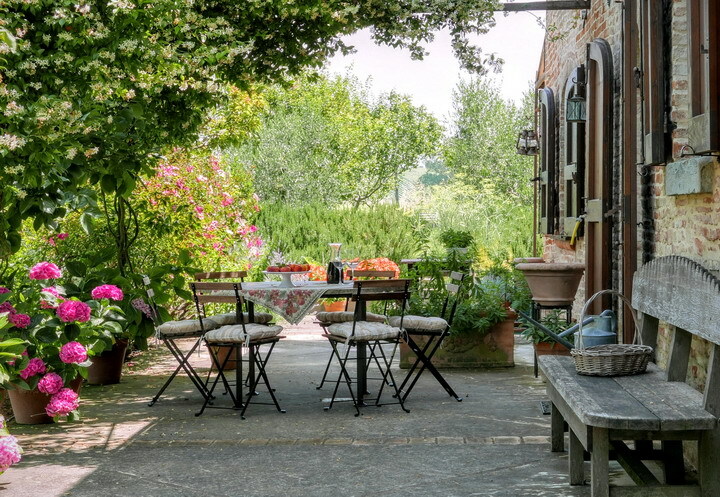 The area is classified as one of the most important for the production of wine, olive oil and cultivated fields, able to tell guests authentic Tuscan life stories.